MONTGOMERY, Alabama — With the Airbus assembly line rising in Mobile, top Alabama leaders, economic development specialists and local officials will head to the Farnborough International Air Show near London next week for talks aimed at expanding the aerospace industry in the state. Governor Robert Bentley will lead a small working team of Alabama officials that will join representatives of municipalities and economic development organizations from across the state at the industry’s most closely watched trade event. The state team includes Greg Canfield, who heads the Alabama Department of Commerce, and two members of the department’s business development team who also will be involved in company meetings. Another Commerce staffer will manage the Department’s exhibition space during the show. “Aerospace and aviation industries are extremely important to Alabama,” Governor Robert Bentley said. “The Farnborough Air Show is a special opportunity to meet with company leaders from many of the world’s largest aerospace and aviation companies and encourage them to choose Alabama. This rendering shows what the Airbus A320 Family Assembly Line will look like when complete. “Companies like Boeing and Airbus already know the business climate in Alabama, and have created good jobs for Alabamians. My goal for the air show is to create more jobs in this sector for the people of Alabama,” he added. Beginning Monday, Secretary Canfield said the Alabama team at Farnborough will be involved in more than 20 meetings with aviation and aerospace companies over three days, with a goal of building new connections or strengthening existing relationships with key industry players. The team also will work to highlight Alabama’s advantages to aerospace prospects. A critical objective for the Alabama working team is to continue efforts to secure links in the supply chain for the Airbus A320 Family Assembly Line in Mobile, which could result in new investment and jobs in the state’s aerospace sector. Another objective is to position Alabama as an ideal location for aerospace research and development centers like the one announced last year by Boeing Co. in Huntsville. The center will have a staff of 350 people developing technology considered strategically important for the company’s future. 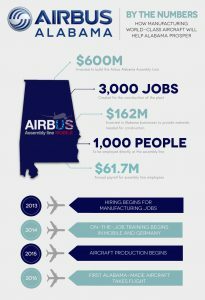 “Airbus’ selection of Alabama for its U.S. production center makes a powerful statement about our capabilities and our infrastructure in this growing industry,” Secretary Canfield said. “By adding passenger jet assembly, Alabama is involved in virtually every segment of the aerospace ecosystem, from engineering and research to advanced manufacturing. The Farnborough Air Show takes place two years after Airbus announced its plans for the $600 million A320 Family production facility, which will have 1,000 workers at the Mobile Aeroplex site at a peak production rate of four aircraft per month. 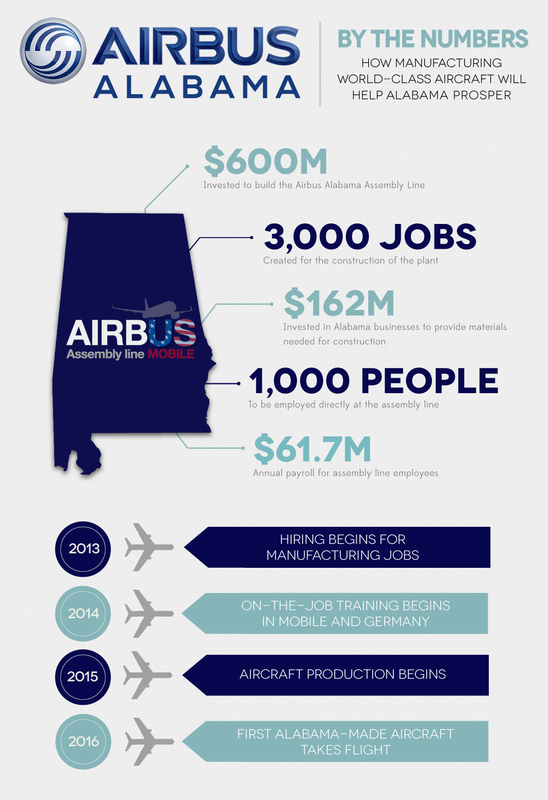 Over the long haul, suppliers to the Airbus Alabama site are expected to create thousands of additional jobs. Steve Sewell, executive vice president at the Economic Development Partnership of Alabama, said suppliers that locate in the state will benefit from investments Alabama has made in education, workforce training and infrastructure to support Airbus. One example is AIDT’s brand-new Alabama Aviation Training Center, established at Mobile Aeroplex to ensure Airbus has the skilled workforce it needs to assemble passenger jets. The project is seen as a major boost to the state’s already robust aerospace/defense sector, which includes 400 companies with around 83,000 employees. The industry’s leading companies, including Lockheed Martin, Raytheon, GE Aviation, GKN Aerospace, all have significant operations in Alabama. In addition, NASA has a major presence in Huntsville with the Marshall Space Flight Center. Canfield said the Alabama team will use talks at Farnborough to build a business case for new investment and jobs throughout the state’s aerospace sector. The Farnborough Air Show and its relative, the Paris Air Show, represent the most important aerospace industry trade events, with billions of dollars in business transactions being announced each year. Economic developers say having a presence at these events is critical to efforts to land aerospace jobs and investment. Lee Lawson, president of the Baldwin County Economic Development Alliance, has attended the European air shows for the past seven years, allowing him to establish relationships with industry figures and positioning him to make new contacts. While in London, Lawson will meet with UTC Aerospace Systems, which has 800 employees at a Foley facility that produces engine nacelles and other components for customers such as Airbus. Since the facility was established in Baldwin County about 20 years ago, its workforce has expanded from a base of less than 100. Lawson said he works closely with the Mobile Area Chamber of Commerce and Mobile Airport Authority on aerospace recruitment, and all cooperate with the Alabama Department of Commerce through a team effort.